Throughout its three hundred year history the Community of True Inspiration has used print media to connect its members and communicate with non-members. Just a few months after their first prayer meeting in the house of E.L. Gruber in November 1714, the Inspirationists published responses to their critics. Soon thereafter they began an extensive publication effort that focused primarily on bringing the inspired testimonies “into the light” (ans Licht gestelt), but also included Inspirationist poetry and hymns. The list of Inspirationist publications in the 18th century surpasses 120 works. Many of the Inspirationist works are anonymous, with little publication information. 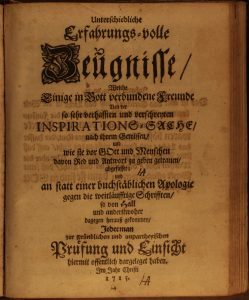 Nevertheless, we are able to confidently identify certain eighteenth- and early-nineteenth-century publications in Germany as “Inspirationist.” The most obvious of course are the printed collections of inspired testimonies of recognized Werkzeuge (instruments) of the community. In the eighteenth century those consisted of four main individuals: Johann Friedrich Rock, Johann Adam Gruber, Johann Carl Gleim, and Ursula Meyer. (It should be noted that testimonies through another dozen individuals exist in manuscript, but were never printed.) Then there are the works authored by, edited by, or compiled by a member of the community: E. L. Gruber, Paul Giesebert Nagel, and Jonas Wickmark primarily. In the case of some works by Johann Adam Gruber, we can add authored by a former member and friend of the community. Inspirationist publications both in Germany and later in America served to create a “community memory” and a united membership. Another motivation for the publications was the edification of the members of the community. This effort was directed toward the younger members of the community as well as the adults. It is not uncommon to find a youth publication that mirrored that for the adults (e.g., catechism and hymnal). 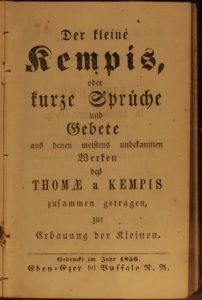 The Inspirationists printed editions of well-known authors Thomas à Kempis and John Bunyan as well as works by relatively obscure writers such as Augustin Fuhrman and Heinrich von Nürnberg. However, the main literary genres represented are unique to them: 1) inspired testimonies, 2) songs and poetry, and 3) last hours of members. A fourth genre is added in communal Amana: children’s schoolbooks. 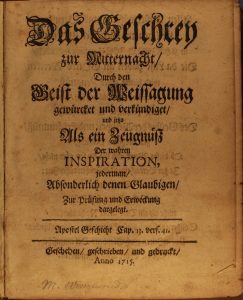 For a complete bibliography of Inspirationist publications see An Annotated Bibliography of Inspirationist Publications in Germany and America, 1715-2013, Richard Couper Press, 2017. 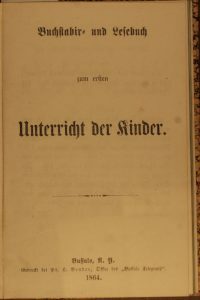 In recent years several organizations have digitized several Inspirationist printed books that are in the public domain (books published prior to 1922 are not subject to copyright and are considered to be “in the public domain”). The table below contains 18th Century Inspirationist books that have been digitized and are available for download. Click the book title to launch the download process. The file will be downloaded to whichever folder on your computer is designated as your download location. Digitized books are large files that must be downloaded to your computer before you can open and view them. Depending on the capacity of your local internet connection, some of the larger files make take several minutes to download. But you need to download a file only one time.